I had trouble extracting this one from its case, and it kind of popped. 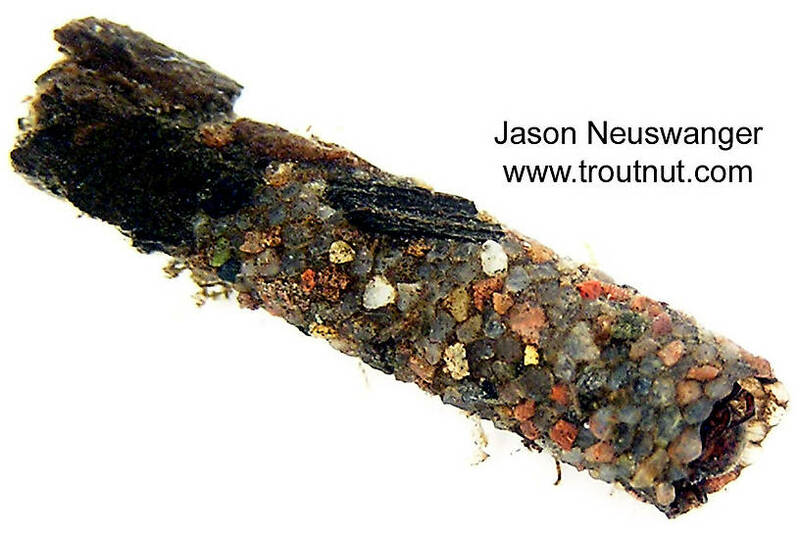 OK, you caddis experts, time for a lesson. For me, that is. I visited a PA spring creek this weekend hoping to catch the Grannom hatch. When I arrived I found the bottom covered in cased larva. These cases were generally roundish, but very irregular looking; at first glance one might think they were very erroded branch sections hollowed out by the bug if he did not know different. 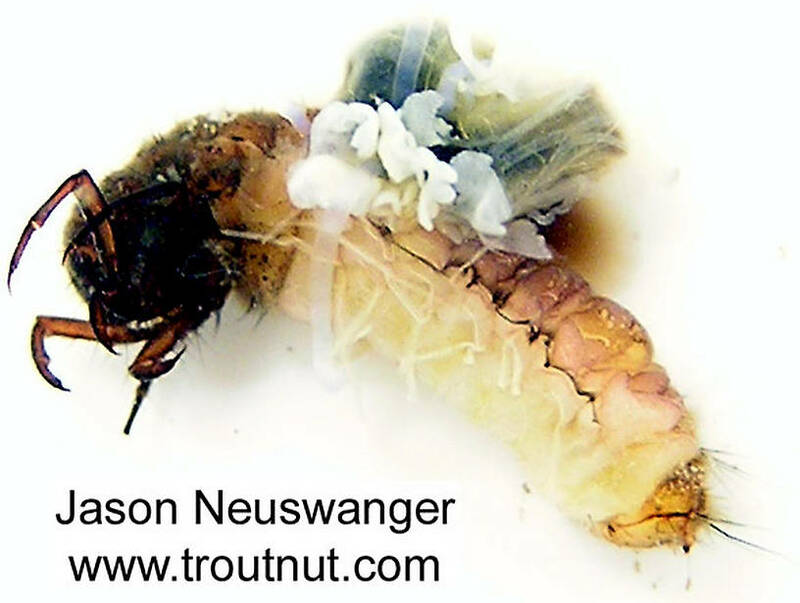 They were just over an inch in length, and the critters inside looked like the one in Jason's photo, some more creamish, some more dirty white tending toward grey. The cases had long flat chunks of wood embedded in them lengthwise, in no particular order, creating a shaggy appearance. Now, I am guessing they were Grannoms, but previously I had thought of Grannoms as having square cases made of small twigs, arranged very neatly, not lengthwise, but side-wise, building a stacked wall to the case with definite visible lines. This kind of case is smaller at the tail and larger at the head. These cases, which I have observed in many streams, are typically dark, where the ones described above are light. The dark cases are smaller, too. I did find one of these small dark cases eventually, tightly sealed, and when I tried to open it, it definitely popped. The bug inside appeared to be a pupa, long dark legs and some dark squished body was all I could make out. When I have opened these in the past I found a blue-green larva. This is what I've always thought of as Grannoms around here. Are these two different species of Grannoms? There were a few adult Grannoms flitting about, dark bodies, grey wings, about a size 14. 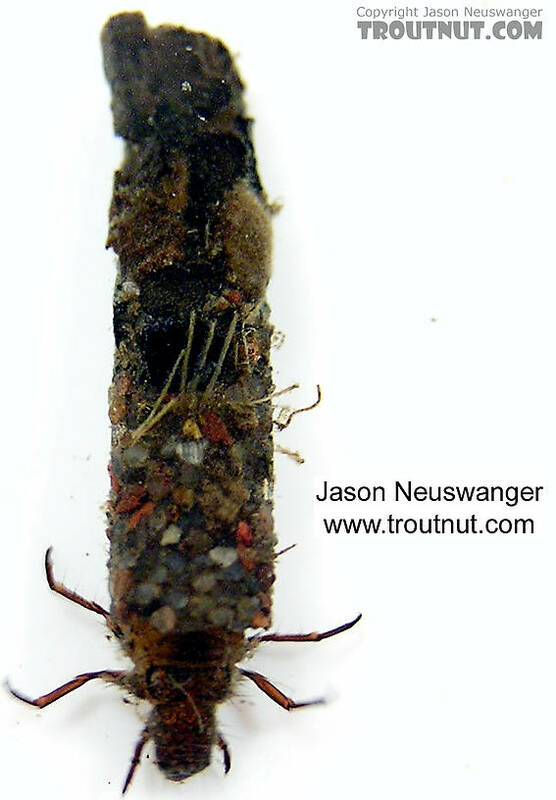 Does anyone want to hazard a guess about these two cased larva based on my descriptions? (Now I really know why they say a picture is worth a thousand words--unfortunately I don't carry a camera.) Also, if the bigger creamish bugs are in larva stage, massing on rocks, are they close to turning into pupa and hatching? Hmmm. How close I wonder.